On Sunday, MetLife Stadium in East Rutherford, New Jersey, hosted Match 19 of the Copa America Centenario. But if you were at the game, you might have thought you were in Ecuador, not the home of the New York Giants and Jets. More than 49,000 fans attended the match, but the stands were a sea of Ecuadorian faithful wearing yellow jerseys and waving Ecuador flags. It seemed like a home game for the ENT, and the team gave their supporters a lot to cheer about by defeating Haiti 4-0 to advance to the Copa quarterfinals. Ecuador cruised to the tournament’s knockout round with goals from Christian Noboa, Enner Valencia, Jaime Ayoví, and Antonio Valencia. El Tri also played well on the defensive half, stopping Haiti from having any continuous threat on goal. The Haitians’ only real opportunity came late in the first half when Jerome Mechack headed one off of the crossbar. But Ecuador’s dominance went beyond the pitch and into the stands, too. 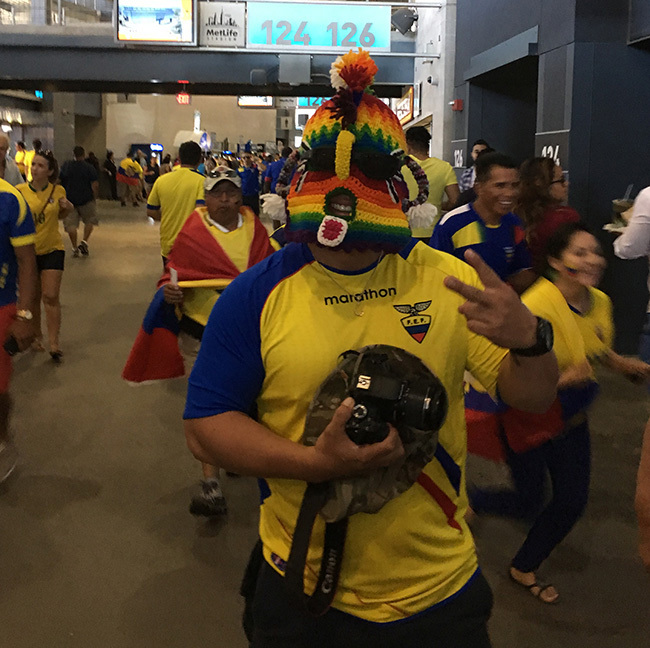 ​One of the first things you noticed walking into the stadium was the sheer dominance of Ecuadorians. From every corner, chants of “ECUADOR! ECUADOR!” could be heard echoing through MetLife’s corridors. When the game began, their excitement intensified. At the mere hint of a goal, they were ready for it. While the Ecuadorians were loud, they were also extremely respectful. They applauded Haiti’s national anthem and opposing players as they came off the field. Ecuador’s fans displayed class all match long and were the epitome of great sports fans. Haitian fans also showed respect and dignity, but they didn’t dominate the stadium like Ecuador’s fans. Still, they did their best to be heard. Haiti supporters were vocal, cheering for their squad and waving flags and banners. They just couldn’t overtake the loudness of the Ecuadorian faithful. If Haiti got close to a scoring chance, the decibel level in the stadium rose dramatically — because Ecuador’s fans worried about an opposing goal. ​In the end, though, Ecuador’s fans had a lot to cheer about. And the ENT drubbing helped advance it through Group B to play the United States on Thursday in the quarterfinals. That match will likely be one of the more intense battles of the quarterfinals. The Americans have home field advantage, but Ecuador has proven to have the most consistently loud and crazed fans in the tournament. It will be interesting to see the two fan bases clash. And you wonder whether the same respect and class will be shown in a grudge match. The two teams faced off roughly three weeks ago, with Darlington Nagbe netting a heart-breaking 90th minute goal (his first for the USMNT) to help the States take home a 1-0 win. Be sure to tune in on one of the FOX channels to see if the American Outlaws propel their team to victory, or if the El Tri faithful can dominate the stands on American soil once again. Either way, it’s sure to be a good one!